Lots of striped socks were on display on the Kiwi side of the field at the annual Ross Island Cup, a rugby union match played every year between Mt. 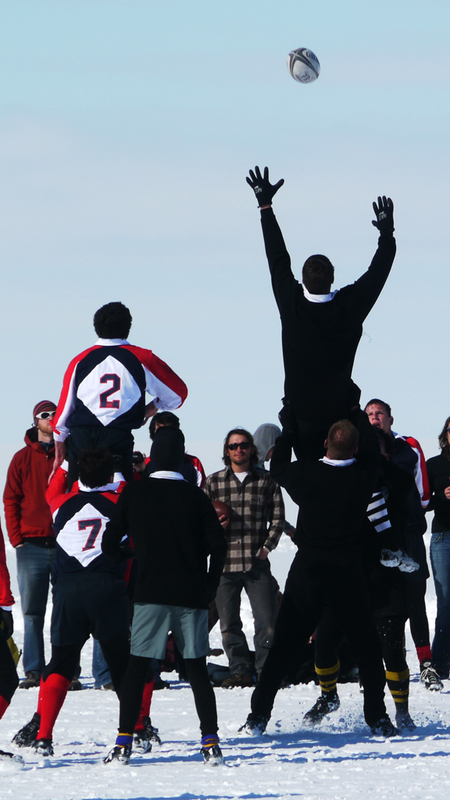 Terror Rugby Club (the U.S.) and the Ice Blacks (New Zealand). Most Kiwis went with black/white stripes, but one guy had yellow/black. The U.S. decided to go with solid red socks and lost, 23-0. It’s warmer here (~35 to 40 degrees) than it is in NYC. The movies show only the miserable weather in Antarctica, but we do alright for ourselves down here in the mid-summer. Great — next week I’ll be getting frostbite in Minneapolis. Meanwhile, I could be lounging around in the sun and maybe getting a tan in Antarctica.